The NASA/ESA Hubble Space Telescope has produced a close-up view of the galaxy Centaurus A. Hubble’s out-of-this-world location and world-class Wide Field Camera 3 instrument reveal a dramatic picture of a dynamic galaxy in flux. 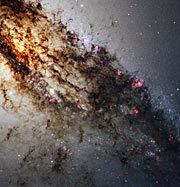 Centaurus A, also known as NGC 5128, is well known for its dramatic dusty lanes of dark material. Hubble’s observations, using its most advanced instrument, the Wide Field Camera 3, are the most detailed ever made of this galaxy. They have been combined here in a multi-wavelength image that reveals never-before-seen detail in the dusty portion of the galaxy. As well as features in the visible spectrum, this composite shows ultraviolet light from young stars, and near-infrared light, which lets us glimpse some of the detail otherwise obscured by the dust. The dark dust lane that crosses Centaurus A does not show an absence of stars, but rather a relative lack of starlight, as the opaque clouds block the visible light from reaching us. Hubble’s Wide Field Camera 3 has focussed on these dusty regions, which span from corner to corner in this image. Wider views from ground-based telescopes show this stripe crossing the entire galaxy. Interesting features such as the warped shape of its disc of gas and dust (outside the view) hint that at some point in the past, Centaurus A collided and merged with another galaxy. The shockwaves of this event caused hydrogen gas to coalesce and sparked intense areas of star formation, as seen in its outlying regions and in red patches visible in this Hubble close-up. The galaxy’s compact nucleus contains a highly active supermassive black hole at its centre. Powerful relativistic jets release vast amounts of radio and X-ray radiation — although these are invisible here as Hubble’s instruments are designed to study optical, ultraviolet and infrared wavelengths. At just over 11 million light-years distant, Centaurus A is relatively nearby in astronomical terms. However, it is not only close, it is also bright. This makes it a very attractive target for amateur astronomers in the southern hemisphere, where it is visible. Stargazers can see the galaxy through binoculars, while larger amateur telescopes begin to unveil the distinctive dusty lanes. However it is only with the capabilities of the Hubble Space Telescope that many of the features in this image become visible: as well as providing unparalleled clarity and resolution, Hubble’s position in orbit means that it can see ultraviolet wavelengths which are blocked by the atmosphere and so invisible from the ground.